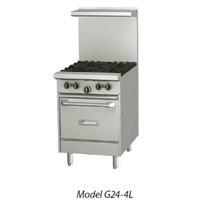 Gas restaurant series range with space saver oven. 23-5/8" (600mm) wide and 27" (686mm) deep work top surfaces. Stainless steel front, sides and 5" wide front rail. 6" (152mm) legs with adjustable feet. Porcelain oven bottom and door liner. Durable heavy duty oven door w/ "keep cool" handle.